One of the most prominent locations where the movie was shot was Evans City Cemetery, located 30 miles north of Pittsburgh. The cemetery has been a host to several NOTLD fans ever since the film broke through the barriers of pop culture, and it still stands as one of the few locations left of the film. Most notably in the background of when Johnny (Russ Streiner) and Barbara (Judith O'Dea) exit their car to visit their father's grave, and when the cemetery zombie (Bill Hinzman) attacks Barbara in the car, you can clearly see a small chapel made out of cement blocks. That same chapel still stands in Evans City Cemetery, but just barely. 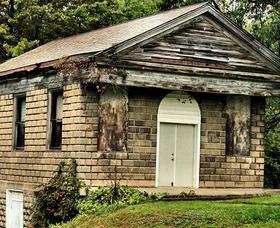 Used primarily as a storage shed for decades, the chapel has fallen into a state of great disrepair. All of the windows are shuttered, the roof is leaking, and the cement bricks are eroded. Time has taken its toll on this iconic landmark. Ron Volz, president of the Evans City Cemetery board, says that although it's structurally sound, it remains a liability to them and needs to be demolished. He estimates that it will take $50,000 to return the chapel to its former glory. Luckily, for NOTLD fans, there is hope. Gary Streiner, a sound engineer on the film, has started a campaign last September to raise the $50,000 needed to help fix the chapel by this October. The response from the fans has been overwhelming, with more than 2,500 members on the official Facebook group, The Living Dead Festival. So far, the group has managed to raise close to $20,000 towards the campaign through E-bay auctions, NOTLD film screenings, donations and much, much more! I encourage everyone and anyone reading this article to donate at least $5 or more to the cause. Every dollar makes the difference. But most of all, spread the word! Tell this to your friends on Facebook! Post something on your Twitter! Spread the word like a virus, a zombie virus! For more information on the Fix the Chapel campaign, visit www.fixthechapel.com. Also, be sure to join the official Facebook group, The Living Dead Festival at www.facebook.com/groups/savethechapel.